The Cultural Survival Trust of Sri Lanka helps traditional communities to design and implement their own culturally sensitive programs instead of choosing between poverty and environmental destruction. These efforts to defend rights, lands and cultures offer an alternative to victimization by economic interests and ideological prejudices. Cultural Survival programs are inspired by a convergence of the crucial needs of the modern world, human rights, the natural environment, and economic development. CST partnerships with traditional communities foster autonomy and local decision-making, two prerequisites for survival. We insist that affected communities must decide for themselves what traditions to maintain -- and how fast to change others -- as they deal with changes in the society around them. 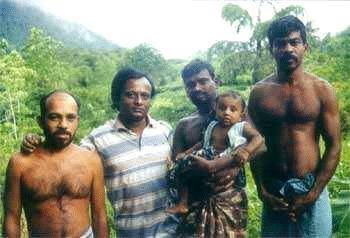 We respond to appeals from local endangered communities with specialized expertise, especially in research and communications, that enable communities to achieve self-sufficiency as quickly as possible through enhanced access to information from related agencies and other traditional communities in Sri Lanka and globally via Cultural Survival's expanding information network. Cultural Survival resource management programs also enhance the ability of traditional communities to secure land rights and manage natural resources. Cultural Survival funding and technical assistance to small-scale efforts helps them to strengthen traditional institutions, enabling them to act as models for other groups facing common threats.